Robinson is the fell that looms directly above Buttermere village, which sits on its lower slopes. Robinson is similar in layout to its neighbour Hindscarth. The summit area runs north-south above Little Dale (to the east) and Buttermere Moss (to the west). In both cases a long ridge runs down into the Newlands Valley - in this case Blea Crags and High Snab Bank. Both fells have smooth steep southern slopes that drop down to Gatesgarthdale Beck and the valley leading to Honister Pass. The pattern is broken on the western flanks of the fell. Here steep slopes drop down from the summit but then the ground levels out and a large wet plateau runs west towards the subsidiary summit of High Snockrigg. This is Buttermere Moss, an unexpectedly swampy area. High Snockrigg itself has two very different flanks, with a steep grassy slope dropping down to the valley of Mill Beck and Newlands Hause and a more rocky craggy face overlooking Buttermere village and lake. The top of Robinson is hidden from view in Buttermere by the lower crags and High Snockrigg at the western end of Buttermere Moss. The upper reaches of Robinson aren't that visible from Buttermere, but the fell does feature in the view of Newlands from the Keswick area, where the vast Robinson Crags loom over Newlands Hause. Robinson can be reached directly from Buttermere along the steep path that leaves the Newlands Hause road at the first bend and climbs up to High Snockrigg before crossing Buttermere Moss to reach the final climb to the summit. A steep path leaves Newlands Hause running south to the plateau of Buttermere Moss - again cross the moss to reach the final summit climb. The fell can be climbed up the very steep path that runs alongside Hassnesshow Beck, starting at a small layby near Dalegarth and Hassness on the northern shore of Buttermere. It is also possible to reach the top by climbing the more gentle slopes above Gatesgarthdale Beck, heading to Littledale Edge. There is an awkward fence to cross, but after that the path is clear, heading west along the edge and then up the final summit climb. Finally the fell can be climbed from the Newlands valley along two parallel routes. Both start at High Snab farm (reached along a good track from Little Town). You can then either follow Scope Beck or the ridge above (High Snab Bank). The two paths merge above Blea Crags and a path runs above a line of crags, reaching the summit from the north. We have one walk on Robinson, ascending the fell from Buttermere village. The summit area is a large moderately level area with a number of low rocky outcroppings (some running in parallel to each other). The highest point on the summit comes towards the middle of this area, with gentle slopes in all directions. 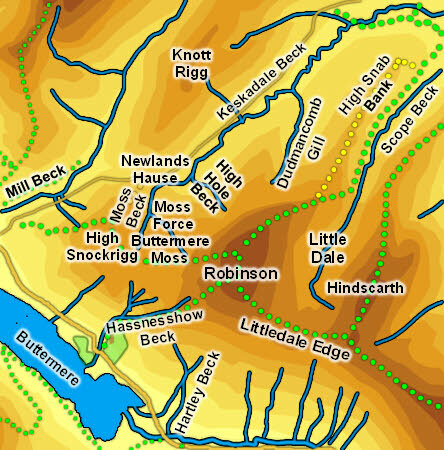 We will start our tour of Robinson's becks at Newlands Hause and go clockwise around the fell. The northern border of the fell is formed by Keskadale Beck, which flows north-east from Newlands Hause towards the Newlands valley. Keskadale Beck flows into Newlands Beck at Little Town. Robinson has a small footing on Newlands Beck, formed by the gap between Keskadale Beck and Scope Beck. Scope Beck forms the eastern boundary of the fell, running north from its source below Littledale Edge to join Newlands Beck just south of Little Town. On the southern side the boundary is formed by Gatesgarthdale Beck. This flows west into Buttermere, which then forms the boundary. The western slopes of Robinson runs without interrupting down to Buttermere village and past onto the fields between Crummock Water and Buttermere, so the fell can claim a footing on Buttermere Dubs and on the eastern shore of Crummock. The north-western boundary is formed by Mill Beck, the stream that runs through Buttermere village. This flows down the valley between High Snockrigg and Whiteless Breast. Finally Swinside Gill rises just to the north of Newlands Hause and flows west for a short distance to join Mill Beck. A sizable number of becks rise on Robinson, but all are short and very few have names. The named tarns start with Moss Beck, which drops off the northern edge of Buttermere Moss, forming Moss Force. To the east of this is High High Beck, which rises below Robinson Crags and soon joins Keskadale Beck. Next along is Dudmancomb Gill, which rises behind Robinson Crags and runs north into Keskadale Beck. The next named beck is Deep Gill, which rises on the slopes to the east of the summit and runs down into Little Dale. On the southern side Hartley Beck flows south to join Gatesgarthdale Beck at Gatesgarth Farm. Finally Goat Gills rise on the southern edge of Buttermere Moss while Hassnesshow Beck is born at the southern end of the summit area. The Goat Gills run into Hassnesshow Beck, which runs down a dramatic little valley and down into Buttermere. Robinson has no named tarns, but it does have a footing on Buttermere lake and technically a small footing on Crummock Water. There is also a tiny unnamed tarn east of the summit. Robinson is unusual in that it sits above two road passes. To the south the road to Honister Pass begins its climb below the slopes of Robinson. To the north the road from Buttermere to the Newlands Valley over Newlands Hause runs up the slopes north of High Snockrigg, then runs down the far side of Keskadale.